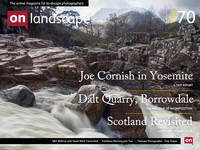 Hello and welcome to On Landscape webinar, a question and answer session with David Ward. David: Good evening, how are you doing Tim ? T: I’m not bad, de-stressed after launching the exhibition yesterday. Whoever said exhibitions are a relaxing affair, they were lying! It’s completely stressful, but quite satisfying in a way as well. D: It’s really nice to see your work up isn’t? I think it’s fantastic. A really important part of the creative process is to share, otherwise what are we doing? T: Absolutely. If no-one has looked at the format for this evening, we’ve got a series of questions, via email, Twitter, Facebook and the webinar. We’ll be going through them, but if you have any questions you’d like to ask. You can use the interface on the right hand side of the screen and our able assistant Charlotte will be compiling those together and passing them on through. We’ve already got around 20 questions which will get us going! So shall we start from the top David ? D: Yeah, go for it, ask away ! T: Right, our first question is from John Dunne via Facebook: Any insights David can share about his unique compositional approach of seeing the landscape in terms of 'graphical' elements would be wonderful. Oh and any news on either a reprint of "Landscape Within" or the ebook version would be nice too ? D: It’s kind of interesting when people talk about my photography as I don’t know I recognise people’s descriptions of my photography. I don’t think of myself as someone, I suppose, who necessarily looks for graphical elements when I’m making a picture. I’m just trying to find what I consider to be the salient parts of a scene when I’m making a photograph. Something will attract my attention and I will try and work out exactly what part of the scene is the most relevant. Then try and work out how to frame that. I don’t set out to think ‘Oh, that’s really graphical, what do I do with that?’, I just find out what is in the scene that interests me I suppose.